The industry of carpet cleaning San Antonio is a rough one. Carpet cleaners are a dime a dozen. If you were to look on Craig’s List the list of carpet cleaners is endless. Then if you were to use a search engine you would have another countless list of carpet cleaners. So how do you know who the right carpet cleaner is for you. Carpet cleaning San Antonio isn’t a choice that should be made lightly. There are many variables that need to be considered and risks that you are taking that you should be made aware of. Carpet cleaning San Antonio is cut throat. Every carpet cleaner is trying to earn your business by cutting the legs of the competition. Whether it be by cutting prices, offering more for your money, or packaging a cleaning service everyone is trying to one up the other carpet cleaning businesses. However, do the risks out weight the price or sweet talk from some of these carpet cleaners? At what price are you willing to risk the care of your carpet? Did you know that if carpet isn’t cleaned the proper way it could cause major problems and more money to fix it? There are so many fly by night carpet cleaners that offer cheap prices. Meaning they are in the carpet cleaning San Antonio business just to make a quick buck and could care less if the carpet cleaning was done right or if you the customer are satisfied. Many of these carpet cleaners use a portable machine which will not give you the kind of clean you are want and over soak the carpets leaving it wet for more then 24 hours. Having wet carpet for hours upon hours, days upon days means you are risking the growth of mold, mildew, and other bacterias which is no good for the health of you and your family. If you are renting or leasing a home you want to make sure the carpet not soaked and is cleaned properly because you will not get your deposit back and you might as well have thrown your money down a drain. However, there are special circumstances in which a customer may need a portable to clean their home. If someone lives or works in a high rise building or an apartment complex in which it is difficult to get reach. Many professional carpet cleaners use truck mounted machines and only have so many feet of hose to reach the home and clean. If you are in a high rise using a truck mount pretty much out of the question unless you were on the first floor. In apartment complexes most are able to use a truck mount machine but it does get difficult if you are on the 3rd floor or higher. Many carpet cleaners don’t care around large amounts of hoses that can reach that far up and some complexes are just difficult to service no matter what floor because of parking issues. A truck mounted machine must be parked as close as possible to a resident or business so hoses can be run through the home and the technician has the freedom to move around inside with the hoses. Anther option would be finding a carpet cleaner who has their own portable water tank; however, those are hard to find and you would still need to worry about parking due to length of hoses. Most professional carpet cleaners such as Beyer Carpet Cleaning San Antonio use truck mounted equipment. This means the steam clean will much hotter then a portable. Steam from a truck mounted machine usually reaches 200 degrees or more. Carpet cleaning San Antonio at this degree mean dust mites, allergens, and other bacteria will be killed leaving you with a healthy carpet. Now just because some is or claims to be a professional because they have website and you found them using a search engine doesn’t mean you can’t run into problems. There are quite a few “professional carpet cleaners” that can leave your carpets wet for more then 24 hours. Carpets should be damp once they have been steam cleaned and should only be damp for about 5-7 hours. You never want your carpets to be soaking wet! Beyer Carpet Cleaning San Antonio never leaves carpets soaking wet and they also offer speed dry which cuts your drying time in half lowering the risk of anything to grow within your carpet. They only use truck mounted equipment and are always fully stocked to tackle any carpet cleaning job. 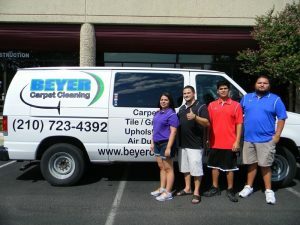 So the next time you are looking for a professional carpet cleaner call Beyer Carpet Cleaning San Antonio!